Point (and click) your way out of trouble in Aventesia. The Book of Unwritten Tales 2 was originally released back in 2015 for PC and subsequently for the PS3, PS4, Xbox 360, Xbox One, and Wii U, but PC is still the definitive way to play the game, and it shows. The Nintendo Switch version could have improved upon the subpar controls from the console versions, but it is baffling that the developers would not adapt its point-and-click nature to the Nintendo Switch screen, which could have perhaps eliminated some of the frustration from selecting the wrong item or moving to a separate area of a room when attempting to select something else entirely. The game supports Joy-Con and Switch Pro controller support, but even when using the analog sticks, it can still be hard highlighting an item. There were times where I would align the character perfectly to a specific object, but I would still have to continue to readjust it until the option appeared. You are able to move the right analog stick to toggle between selections, but unless you are close to them, you won’t even be able to highlight them. Character movement was also a little clunky, and sometimes it was an exercise in futility just to get them to turn the right way. Oftentimes it made me feel like I was playing Resident Evil on the PS One because of what felt like a return to the tank controls. Going back and forth between areas, or even navigating on a single stage can take a long time, as the game doesn’t feature a “run” button. Instead, you settle with the characters walking back and forth, which can make a short stage longer than it needs to be. That’s not to say that the game in itself isn’t worthwhile, but the use of the touchscreen could have added more accuracy to the selections as well as a run button, which could have made the Nintendo Switch version the undeniable go-to version outside of PC. In terms of story, it continues the wacky adventure of Nate, Princess Ivo, Wilbur, and Critter, who continue to be at their best with smart one-liners and engaging dialogue. This time around, a new threat is endangering the world of Avantasia, one that obviously involves puppies and dollhouses. If you never experienced the original game, you will have missed a very fun and quirky adventure, but sadly the game hasn’t been released on the Nintendo Switch and never made it out on the Wii U. KING Art does have another point-and-click game, The Raven: Remastered, which released back in January on Switch which has received favorable reviews. The Book of Unwritten Tales 2 does not take itself too seriously (or at all), something that is clear from the very beginning and the game is all the better for it. Starting with the very first scene, it lays the foundation of what the game will be, and that is a comedy that loads a lot of punches and delivers on most of them. The narrative in itself drives the game, and the mixture of likeable characters and funny situations can certainly eclipse most of the technical complaints. Breaking the fourth wall is not uncommon, although not as on-the-nose as YIIK: A Postmodern RPG which I played recently. The characters are well acted and the delivery of the voice actors plays a crucial part in the fun. Humor is not the only thing that endeared me to the story. The Book of Unwritten Tales 2 packs a lot of pop culture references and discovering them along the way was part of the fun. Just within the first couple of minutes, I was introduced to a Nabbit doll (Super Mario), a Sully fursuit (Monster’s Inc.), the three dragon eggs from Game of Thrones, a Rubix cube, and countless others. At times it might feel like the developers overdid it and it might be overkill for some, but it actually improved my enjoyment. It’s been four years since the game came out for PC, so you would expect the Nintendo Switch to at least hold its own when it comes to the graphics department, and for the most part, the presentation is faithful to the original game’s release. Character models may look a little off with some jagged edges compared to its PC counterpart, but that’s something that is only really noticeable if you hold them side by side. Overall, the visuals are certainly a highlight to me. Music is another highlight of the game, with a great mixture of fantastical symphonies accompanied by subtle sound effects that appropriately compliment the magical nature. It may not be exactly Howard Shore’s Lord of the Rings score, but the music never had a dull moment. Sometimes the music would work the opposite way, lingering as a reminder that you had spent countless minutes stuck in a puzzle that otherwise would have taken just a couple, but nevertheless, it was through and through enjoyable. As you advance through the story, you will be presented to a new cast of character that will join your established heroes on their quest. Not only is this significant as it expands the story and adds a new narrative, but the puzzles themselves rely on alternating between characters on a whim. Just be prepared to spend even more time trying to solve puzzles, since you not only will have to figure out where to go, but which character to use. It is somewhat sad that this is a one-player game, as I am sure it would have been hilarious in a group setting as you fail frantically to figure out where to go and what to do. 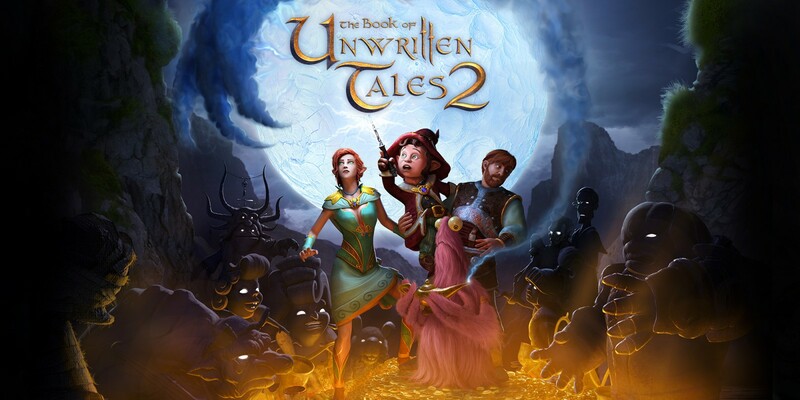 The Book of Unwritten Tales 2 is a fun ride for those of you that are willing to overlook its sometimes-inaccurate controls, but the humor and narrative drive what is a very solid and engaging story. It is crucial that you familiarize yourself with point-and-click games before you decide to dip on this one as it may not be for everyone. The graphics might not be as fleshed out as the PC version, but hold their own very well, and if you are willing to press through its initial shortcomings, the journey in itself is very well worth taking.